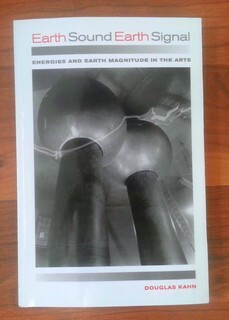 This fantastic book chronicles the history of sonified electromagnetism in the arts (and sciences). Kahn coins the term “Aelectrosonics” – the sounds created by the natural electromagnetic activity on earth and in space. All because we included the earth and space in our communication circuits (earth as electrical ground, the atmosphere as transmission medium for radio). From accidental listening – hearing the Aurora Borealis or whistlers on the telegraph and telephone lines of the 19th century – to sonifying brainwaves (Alvin Lucier) – to earth hums and moon bounces, to Alexander Graham Bell’s photophone and Robert Barry’s energy art. Posted in Inspiration and tagged book.